It doesn't look like it, but Spring is just around the corner, and as usual, I am woefully behind on my winter project list. 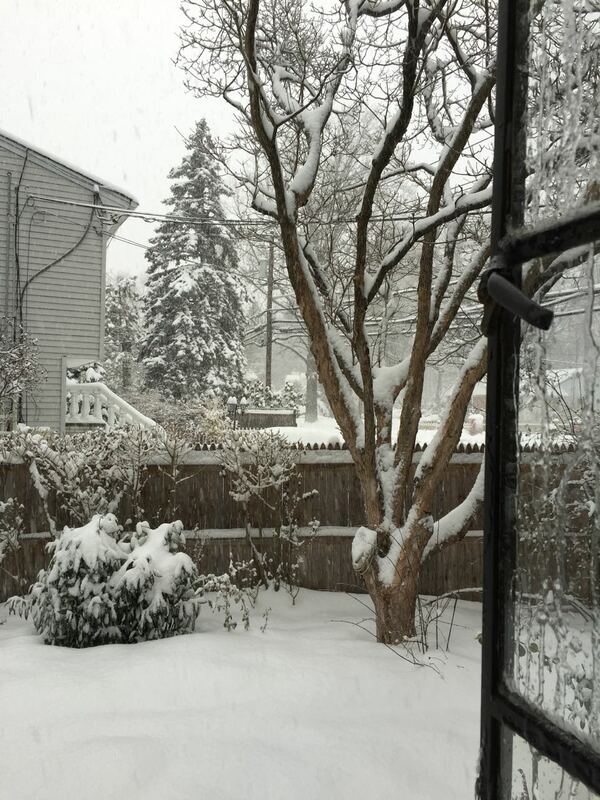 Just last week, as snow accumulated on bare limbs, I realized that I needed to get a move on if I meant to get my #1 project -- a new bowsprit for the Blue Moon -- done in time for her launching in April. And while I started to gather plans, tools, and materials for that project, I made a final push to finish my nearly-done bench. Most of the bench has been done since before Christmas, but work on the final piece -- the face and end vices, had to be put off while wind chimes and bird houses were built for presents. The article this bench is sourced from called it a 'weekend project'. That was a bit optimistic, particularly after I made the decision to build the front piece not from 2x6s, but from hard maple. 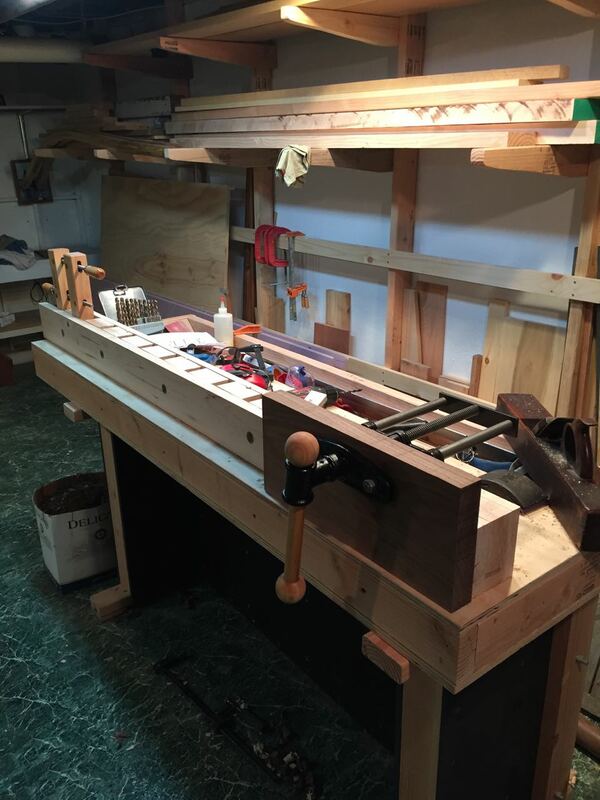 As you can see from the photos below, the front piece is made of two long pieces of maple, with several short pieces in between, leaving gaps for rectangular bench stops. 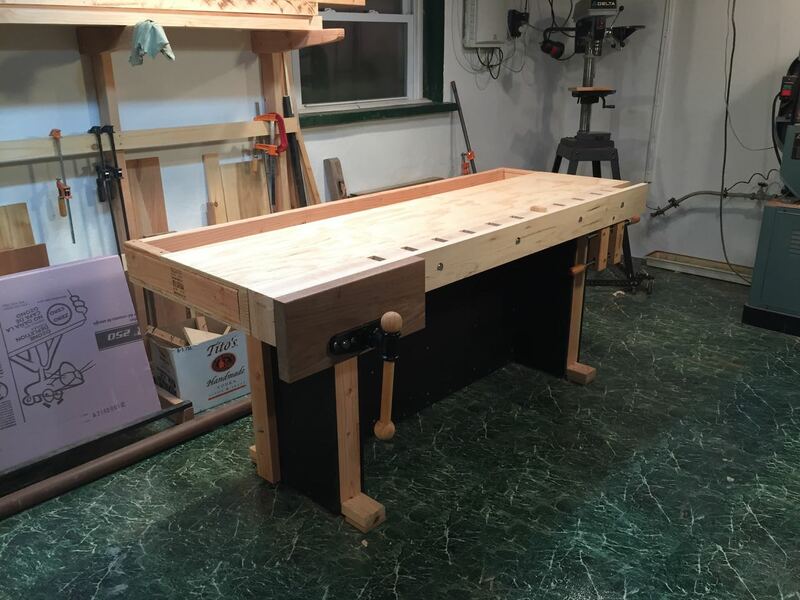 I built this using rough-cut maple jointed by hand with my old wooden jack plane. The boards had quite a bit of wind in them, and it was quite a challenge to get them straight with my simple tools and (very!) limited skills, but with many cups of tea supplied by Helena, I finally got them straight. Having the main part of the bench built made the job much easier, of course, because it was already a better bench than I'd ever used. Planing the faces was done with a simple stop clamped to the edge of the bench, and to get the edges square, I clamped the piece to the front of the bench with long bar clamps. I had Helena hold a piece of white paper behind the second winding stick in the photo below to take this photo, so you can see how much twist there was in the board. If you don't know, winding sticks are just two straight sticks you put across both ends of the board. If there is no 'wind' to the board, the tops of the sticks will line up. Otherwise, the far stick will be rolled up to the right or left, depending on which way the board twists. You can see here, the board twists counter-clockwise from close end to far end. The technique I used to get the wind out of the board was to plane primarily from the front-left corner, to the back-right corner. This takes the wind out fairly quickly. 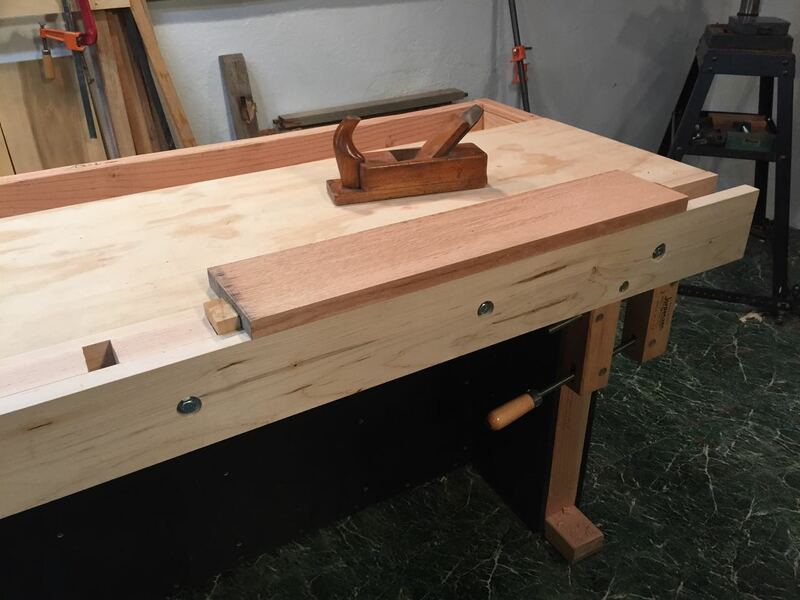 The bigger challenge was to get the edge of the board dead straight, so it matched up perfectly with the top of the bench when clamped in place. My key strategy with this was to focus on the inside of the edge, leaving the ends high, because I tend to round off the ends of edges. By getting the inside part of the edge flat first, I was then able to quickly plane the ends flat. Since I'm not very good at planing, and my plane is... well... less than perfect, shall we say... this took a long time! And then there were two more to do! 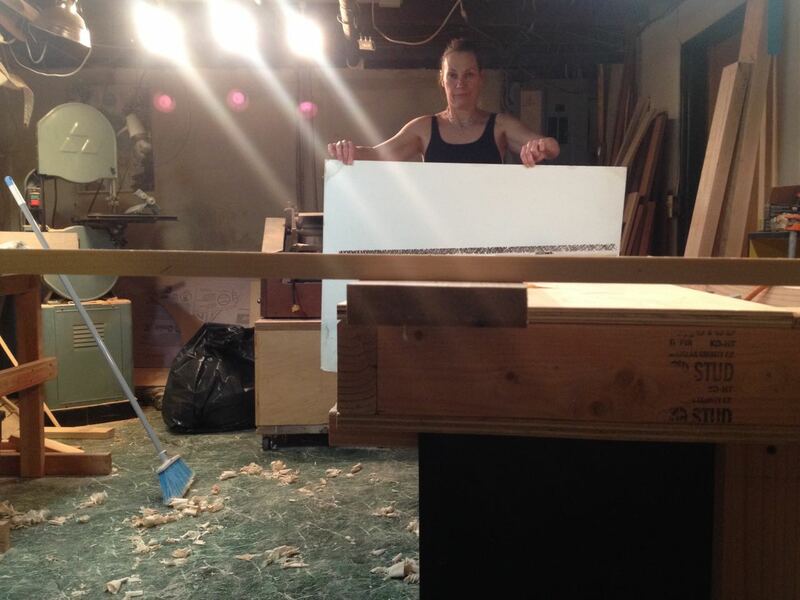 Planing the edge of the board... Not sure why I had the third clamp in the middle for this picture! But in the end, all three boards were flat and straight, and I glued them up as per the instructions in the article. Then it was time to attach the vice. 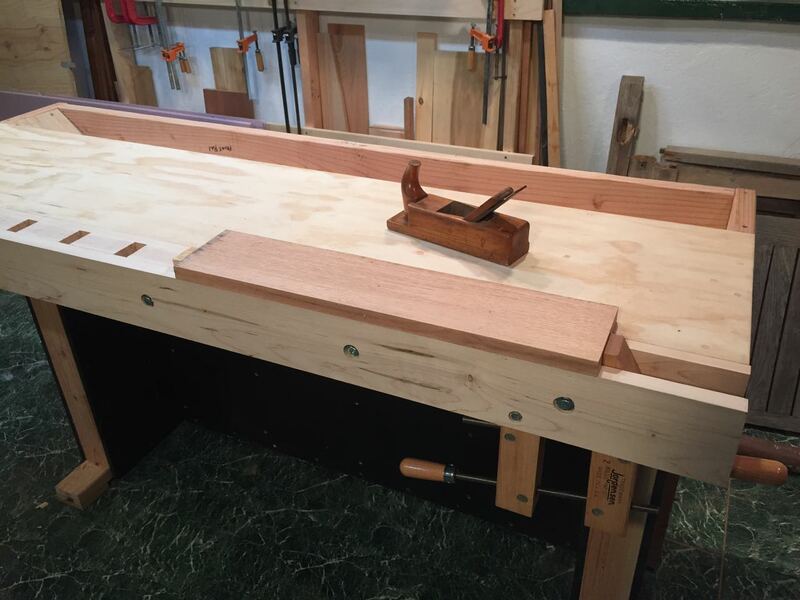 The front vise was the main expense of the bench, because I wanted a good one. After looking at several, I chose the Rockler heavy duty quick release vise. I'd been waiting many years for a decent vise and I'd learned enough to know that cheap tools are a lousy investment. Even so, it wasn't very expensive, and after trying it out, well worth the little money they ask for it. 'Quick release', if you don't know, means you when you turn the handle a half-turn, the mechanism unlocks, and you can then pull the vice front out freely, or push it in. This makes the vise much easier to use, and even after only using it for a few days, I'm glad I got one with this feature. The vise is fastened to the bottom of the bench front with four long lag bolts. I put washers under the vise for the back bolts to pitch the top of the vise a bit closer to the bench. This means the top of the vise closes first, compensating for any wracking, and allowing for a very tight hold. The vise face, by the way, is a bit of scrap walnut left over from last year, when I made a bunch of cutting boards for Christmas presents. I love my 'scrap' pile! Rockler front vise screwed to the bottom of the bench front. At the other end of the front is Tom's innovative 'tail vise'. This is simply a big Jorgensen clamp with one jaw bolted into the front, and the other left free to move. I will show you how this works in a moment. And here is the finished bench, with the front bolted into position with 5 very large lag bolts. 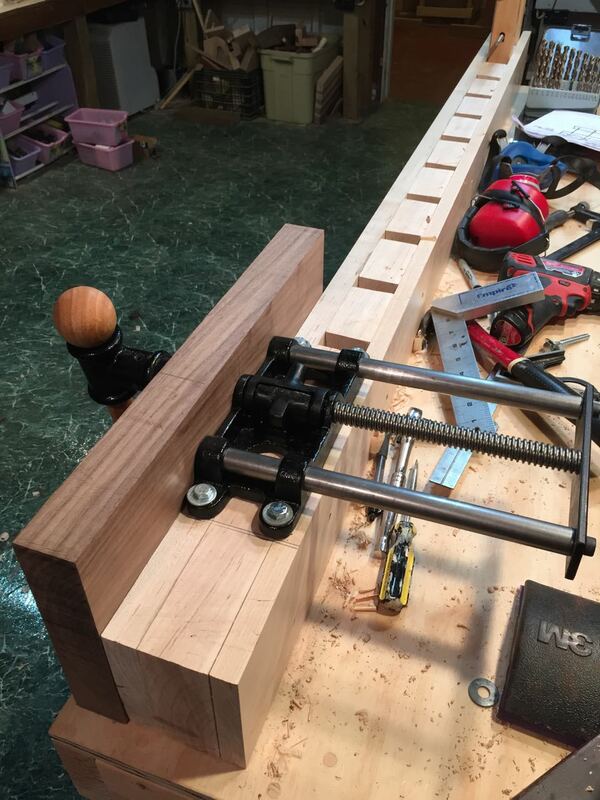 The bolt heads are recessed into the bench, leaving the bench front flat for clamping. I must say, in all humility, that considering its mainly built from 2x4s and plywood, it doesn't look half-bad! What do you think? 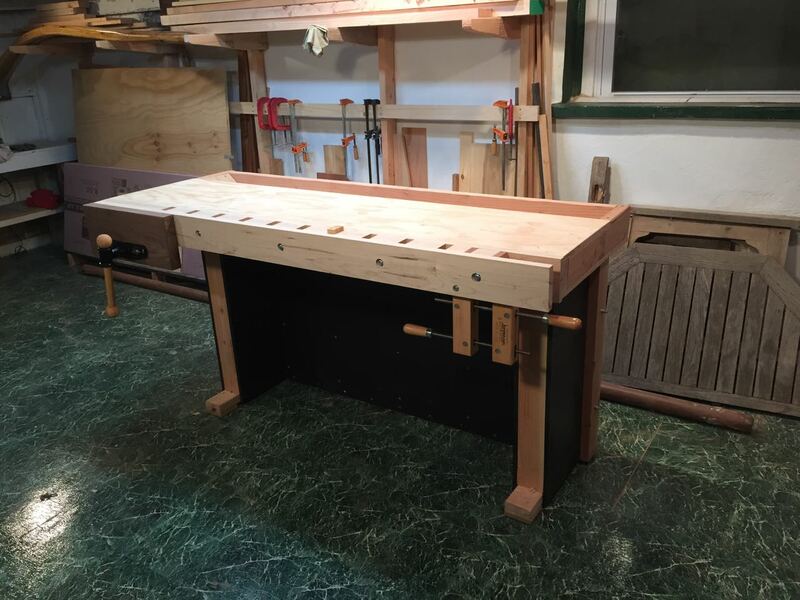 My new bench, finally complete! More important, it is rock solid, and very heavy. 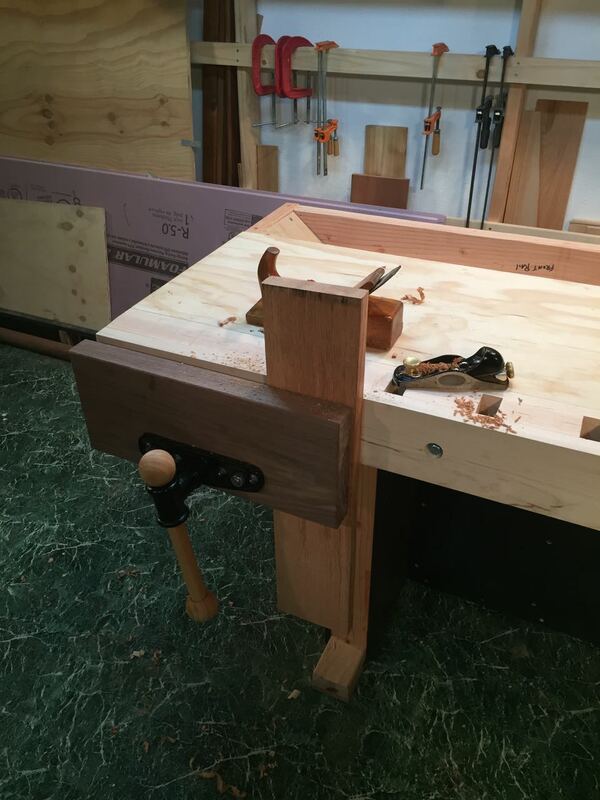 One of the features I didn't appreciate until I moved the bench to it's home on the other side of my work shop, is that it's feet can be easily re-leveled. Just loosen the two 6' threaded rods that hold the leg ends to the center spacer, and the feet find their own level on the floor. Just tighten the nuts again, and the feet are firmly planted on the floor. No wobble. Not even a hint of a wobble. Here I demonstrate how the tail vise (clamp?) works. 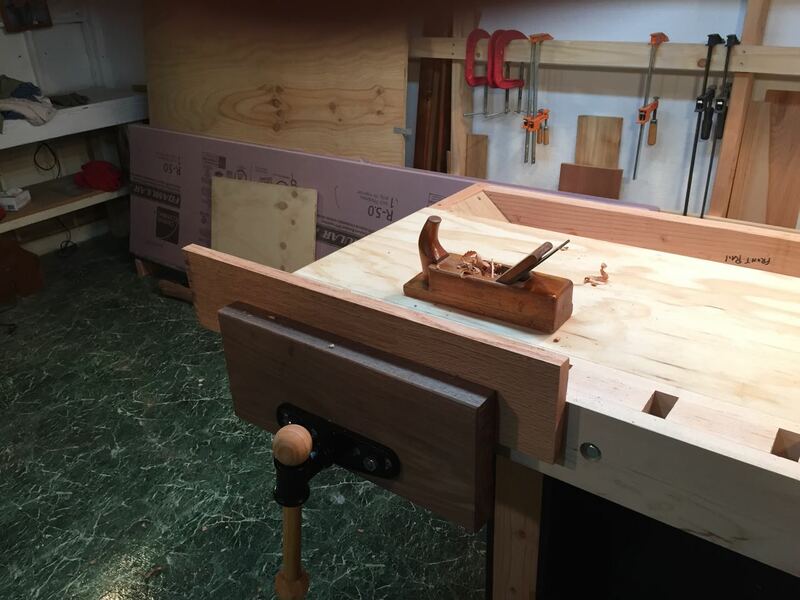 You just slip a bench stop into the appropriate hole, loosen the clamp using the two handles, drop the board into position, and clamp it in place. Because the right jaw is free to move up and down as well as in and out, it is easy to position it just right on the board so it has a good grip, yet is out of the way of the plane. The Jorgensen clamps are very powerful, so the board is held very firmly, without fear of crushing the end of the board. The bench stop in the photo below is just the scrap of wood I used as a spacer when laying out the pieces in the front. I intend to make a fancier one out of some nice hardwood, but for the moment, it's working just fine. And here is the front vice in action. 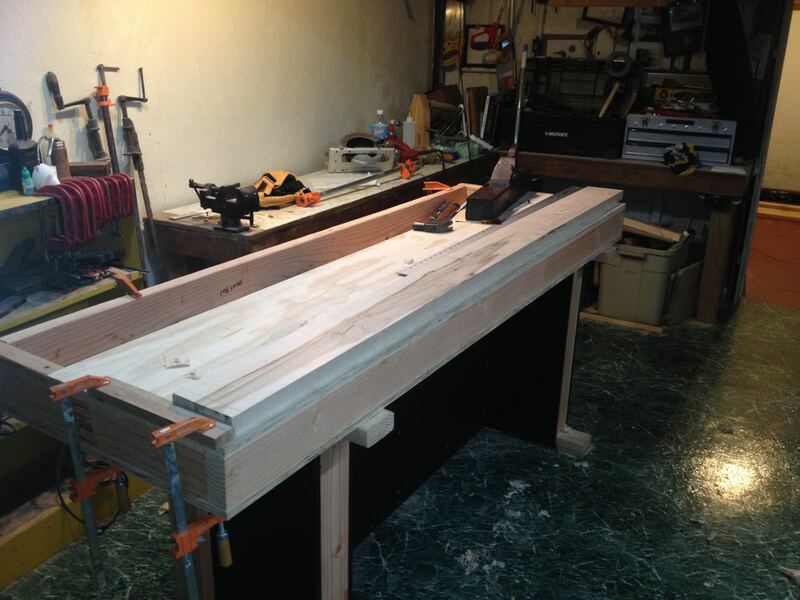 You cannot imagine how long I've waited for a vise and bench that would make planing easier. Taking a few strokes with my old smoothing plane was quite, quite satisfying. Finally, here I am doing a bit of end-grain planing with my block plane. 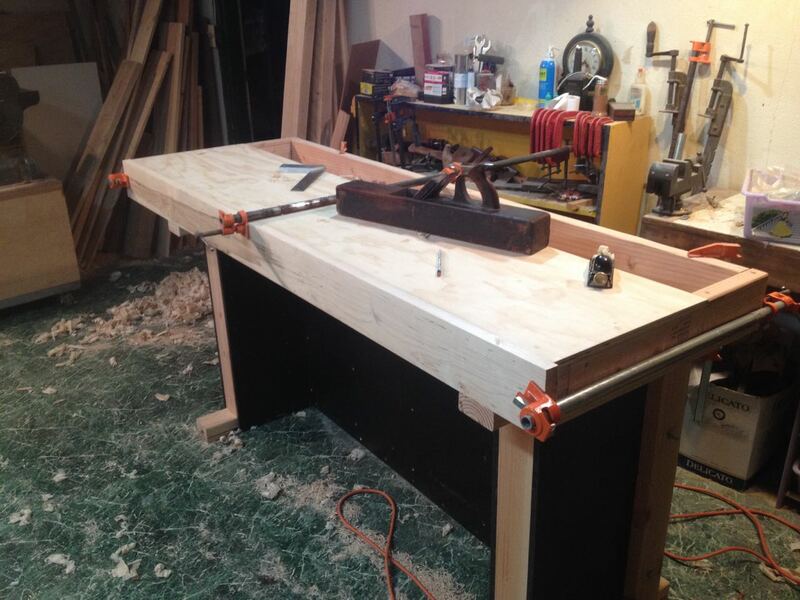 An impossible job without a decent vise and bench. So, not quite a weekend project, but a huge step forward for my shop. 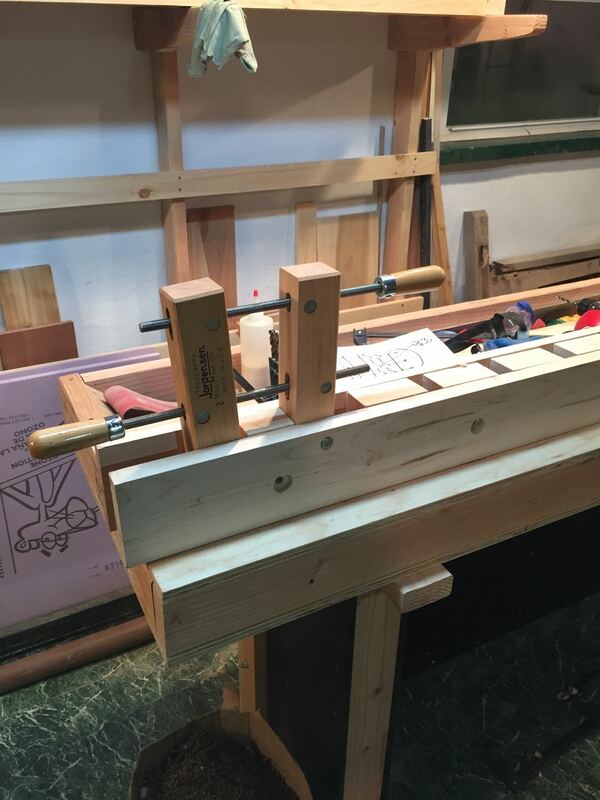 I will be building a set of wooden bench planes to go along with the bench in future episodes, but now I must turn to the urgent task at hand -- building a new bowsprit.